Thank you for contacting the City of Fremont, Maintenance Division. Because this is private property, our Code Enforcement will further handle these concerns. We have forwarded your report to their department. If you have further questions regarding this issue, please feel free to contact them directly at 510-494-4430 or email cod_enf@fremont.gov. traffic cover lid broken. placed safety cone over hole. There are so many potholes on the Hilo St. between Besco Dr. and Robin St., and it becomes so dangerous when parents drop off their kids at Blacow Elementary School. During the morning and afternoon. 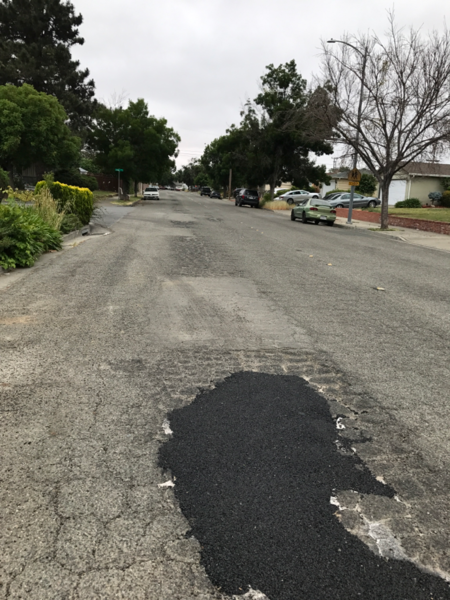 Most of our neighbor pay so much attention to the potholes, and it could miss the kids who across the street, please fix the problem before its too late. Thank you for your email, I have made a work order regarding the pothole issues. You didn't respond since last update, the condition of Hilo street is so bad, why city don't fix it? There is a bunch of wild palm trees now growing at the corner of Fontes and Palm Av. The dried leaves are so large that they lietrally block the left turn visibility coming out of Fontes drive onto Palm Ave esp left turns. Needs immediate maintenance. Besides this I noticed one of the Palm tree is directly under electricity cables when I went to take a picture. This is soon to be an electrical hazard needing prompt attendance. Thank you for your email, Unfortunately these trees are the responsibility of the property owners to maintain so I will pass this on to our Tree Permit Dept. so that they can notify the property owner. Yvette, this is still pending and not fixed - does the Fremont city plan on going the PGE way. We have a storm coming this week and the city seems to like handing off within departments and contractors vs actually doing things. Please respond on how the city will close this - not make it somebody else's problem. This issue has been forwarded to our Tree Permit Department. Thank you a work order has been made for abatement. Bike lanes on Warm Springs Blvd are routinely blocked with construction signs. This causes dangerous merges into car lanes for cyclists or scooters which go much slower than automotive traffic. In many cases in Fremont, an automotive lane is not closed off at all, only the bike lane for a construction sign that says "share the road". Construction signage like this should not be present in the bike lane. If a lane needs to be closed, a vehicle lane should be closed and an alternative path for cyclists/scooters should be provided. Thank you for contacting the City of Fremont, Maintenance Division. We appreciate you taking the time to communicate your concern to us. Construction signs are placed for various different reasons, and can be placed by numerous sources--i.e. : various City of Fremont departments and contractors. In order to assist you with this request, we must determine who placed those signs as they are the responsibility of said group. This concern will be investigated in order to determine ownership. Seen this car parked here for weeks; excessive bird droppings suggest vehicle may be abandoned/stolen. Sofa Behind building. Unable to identify dumper.